We’re pleased to announce that ClassJuggler has just added FUN BUS to its roster of franchise businesses that are using ClassJuggler as the business management software for its franchisees throughout the country. FUN BUS is a growing and dynamic business, and we look forward to supporting them with our cloud-based software. The nature of their mobile, transformed school buses and fitness-focused franchises makes an always-available online solution such as ClassJuggler a perfect match for them. We hope to further solidify that reputation with the way we engage with the FUN BUS franchise owners. We’ve been providing such services – to both franchises and individual class-based businesses (such as dance studios, swim schools, cheer/gymnastics schools, and K12 and after-school enrichment programs) – for 10 years now, We will immediately begin rolling out our service and training to each of the FUN BUS franchises. Located throughout the United States, each FUN BUS franchise uses a mobile bus to literally deliver a combination of fun and fitness to schools, parties, and other neighborhood venues. FUN BUS seeks to enhance children’s lives by building self-esteem while perfecting coordination and motor skills in a structured, positive and safe environment. The Fun Bus interactive fitness program introduces fitness in a fun format for children. FUN BUS offers affordable franchise operations to individuals interested in operating a FUN BUS in their own neighborhood. If you’re a franchise business owner or franchise operator, learn more about our franchise business software, or contact us to discuss your needs and how we can help. This entry was posted in About ClassJuggler, ClassJuggler for Franchises and tagged franchise management, franchise management software, franchise software on November 19, 2015 by classjuggler. To learn how Music ClassJuggler can help your school SUCCEED with less trying, see www.MusicClassJuggler.com. 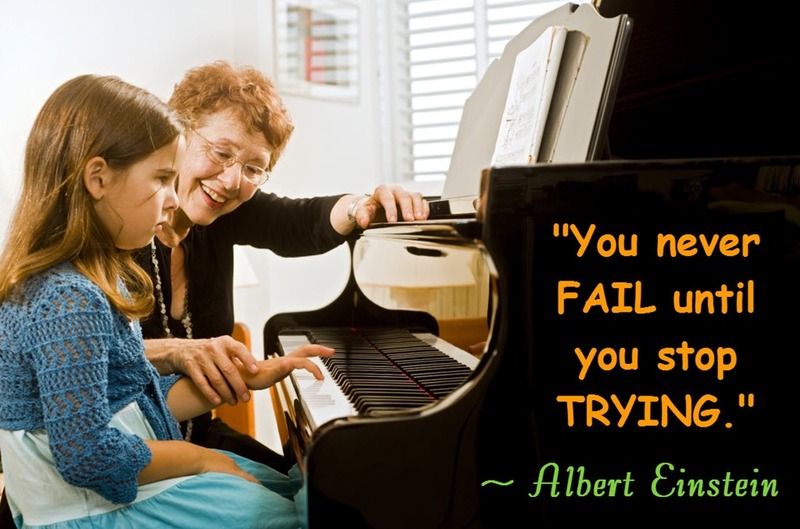 This entry was posted in Motivation, Music ClassJuggler and tagged Albert Einstein, motivational quotes, music school, music teachers on November 17, 2015 by classjuggler. One of the many ways we communicate with you, our ClassJuggler users is to display an alert or confirmation window when you log in – messages important to your ClassJuggler usage – and other messages to confirm certain critical actions you’re about to take. For example, we use a popup message when you’re voiding a payment or deleting a customer record to request that you verify this permanent action. However, if you have a browser pop-up blocker enabled, it can cause confusion and make it seem like ClassJuggler is not working because that confirmation window simply doesn’t appear. In fact, we get many support calls from problems with using ClassJuggler when the problem is simply the way Web browser software settings are marked, blocking ClassJuggler’s alerts and confirmation windows. Unfortunately, if you don’t read this alert and just close this message, you’ll likely miss important process-related pop-ups from us. Disabling your pop-up blocker in Safari or Firefox is easy and will fix your problems in a jiffy. The pop-up blocker settings are always under Preferences, which you find by clicking the Safari or Firefox menu just to the right of your apple menu. In Safari, go to the security tab and uncheck the pop-blocker setting. On Firefox, go to the content menu and choose the “exceptions” button to the right of the block pop-ups checkbox and add “classjuggler.com” as an exception to the list. 4. Add “classjuggler.com” as an exception to the list. 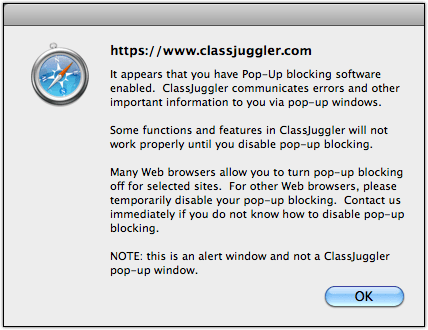 Then, when using ClassJuggler, the popup messages won’t be blocked by your browser. Important: Other Web browsers, such Internet Explorer and Chrome are not supported, so use at your own risk. This entry was posted in About ClassJuggler, Cheer ClassJuggler, ClassJuggler Dance, ClassJuggler Dojo, ClassJuggler Fitness, ClassJuggler for Franchises, ClassJuggler K-12, Music ClassJuggler, Swim ClassJuggler and tagged software for dance studios, software for swim schools, software for tennis schools on November 5, 2015 by classjuggler.